Elevated intraocular pressure (high pressure within the eye) is the number one risk factor for glaucoma. 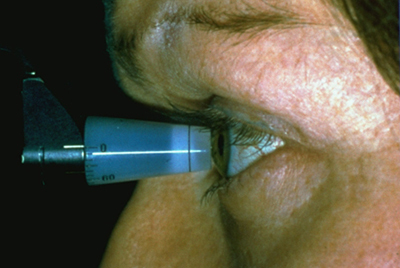 However, elevated intraocular pressure (IOP) does not always cause glaucoma. The average eye pressure in adults ranges between 10 mm Hg and 21 mm Hg (“mm Hg” stands for “millimeters of mercury”). There can be a significant difference in your IOP throughout the course of a day. This variation is known as diurnal fluctuation. We know that many patients with IOP in the 20s do not develop glaucoma. Up to 50% of patients diagnosed with glaucoma have an initial pressure reading lower than 22 mm Hg. Intraocular pressure is not a very sensitive tool for diagnosing glaucoma, but it becomes very useful in monitoring treatment for glaucoma. 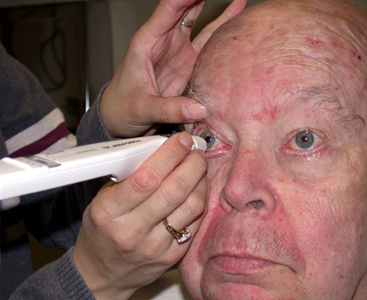 A variety of methods can be used to check the intraocular pressure, but the most common is applanation tonometry. Your ophthalmologist (Eye M.D.) will often set a “target” pressure for you and will work hard to keep the pressure at or below that target to help preserve your vision.